If you've ever mixed vinegar (which contains acetic acid) and sodium bicarbonate, which is a base, you've seen an acid-base or neutralization reaction before. Just like the vinegar and the baking soda, when sulfuric acid is mixed with a base, the two will neutralize each other. This kind of reaction is called a neutralization reaction. Chemists define acids and bases in three different ways, but the most useful everyday definition describes an acid as a substance that wants to give away hydrogen ions, while a base wants to pick them up. Strong acids are better at giving away their hydrogen ions, and sulfuric acid is definitely a strong acid, so when it's in water, it's almost completely deprotonated -- virtually all the sulfuric acid molecules have given up both their hydrogen ions. These donated hydrogen ions are accepted by water molecules, which become hydronium ions. The formula for a hydronium ion is H3O+. When the base or alkaline solution is added to the sulfuric acid, the acid and base react by neutralizing each other. The basic species has been taking hydrogen ions away from water molecules, so it has a high concentration of hydroxide ions. Hydroxide and hydronium ions react to make water molecules, leaving a salt (the product of an acid-base reaction). Since sulfuric acid is a strong acid, one of two things could happen. If the base is a strong base like potassium hydroxide, the resulting salt (e.g., potassium sulfate) will be neutral, in other words, neither an acid nor a base. If the base is a weak base like ammonia, however, the resulting salt will be an acidic salt, which acts as a weak acid (e.g., ammonium sulfate). It's important to note that since it has two hydrogen ions it can give away, one molecule of sulfuric acid can neutralize two molecules of a base like sodium hydroxide. Since baking soda is often used to neutralize battery acid spills on cars or acid spills in labs, the reaction of sulfuric acid with baking soda is a common example that features a little twist. When the bicarbonate from the baking soda comes in contact with the sulfuric acid solution, it accepts hydrogen ions to become carbonic acid. Carbonic acid can decompose to yield water and carbon dioxide; however, and as the sulfuric acid and baking soda react, the concentration of carbonic acid rapidly accumulates, thereby favoring the formation of carbon dioxide. A seething mass of bubbles form as this carbon dioxide escapes from the solution. This reaction is a simple illustration of Le Chatellier's principle -- when changes in concentration disturb a dynamic equilibrium, the system reacts in a way that tends to restore equilibrium. The reaction between sulfuric acid and calcium carbonate is similar in some ways to the reaction with baking soda -- the carbon dioxide bubbles off, and the salt that remains behind is calcium sulfate. 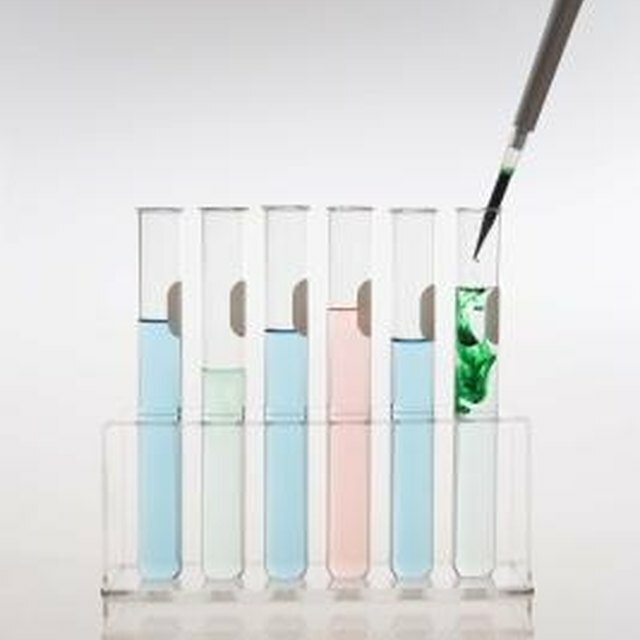 Reacting sulfuric acid with the strong base sodium hydroxide will make sodium sulfate, while sulfuric acid with cupric oxide will form the blue compound copper (II) sulfate. Sulfuric acid is such a strong acid it can actually be used to stick a hydrogen ion onto nitric acid, forming the nitronium ion. This reaction is used in the manufacture of one of the world's most famous explosives -- 2,4,6-trinitrotoluene or TNT. Brennan, John. "What Type of Reaction Is Occurring When Sulfuric Acid Reacts With an Alkaline?" 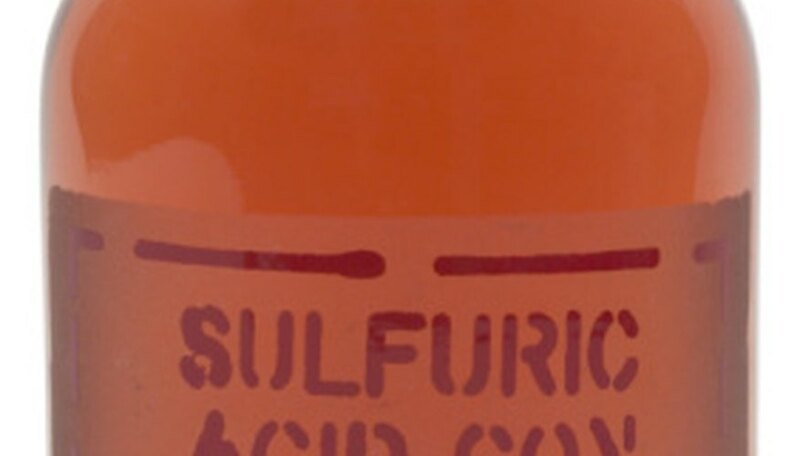 Sciencing, https://sciencing.com/type-sulfuric-acid-reacts-alkaline-8414641.html. 25 April 2017.